This micro size cartridge battery vaporizer measures in at around 2 inches tall by just under an inch wide and weighs only about 1oz. 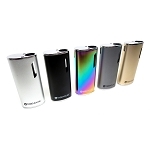 The compact size and lightweight construction deliver a great portable vaping experience. Whenever you are ready to travel it will comfortably fit in a pants/jacket pocket or if you prefer attach the included matching black lanyard to keep it around your neck and ready to go at all times. 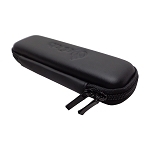 Each of the eDab Fantom vaporizer kits come complete with a removable black shell that creates a protective barrier over your essential oil vape cartridge. These shells will not only prevent damage to your atomizer, they will also prevent prying eyes from easily seeing what you have inside, making it a great vape for discreet use on the go. 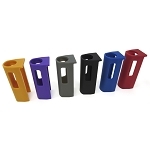 The Fantom Shells are now made available in 8 unique color options including Black, Blue, Red, Ultraviolet (Purple), Gunmetal Grey and the newest Honey (Gold) option. Pick out your favorite color or collect the entire set above at a discounted price! With each Fantom Kit you now have the option of purchasing a Basic (Battery Only) Set or Complete Kit that includes a premium Fantom Oil Cartridge. This advanced 510 thread heating attachment sports a leak-proof cup style structure and wickless ceramic heating element that together deliver an ultra convenient and pleasurable on the go vape experience. 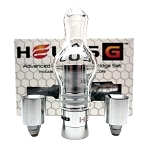 It is equipped with adjustable top airflow control, quad 1.8mm oil wicking ports and it features a heavy duty stainless steel construction with Pyrex glass tube that is very durable and long-lasting. Refilling these innovative oil cartridges is as easy as it gets. All you have to do is unscrew the top center post, fill your oils up to the maximum 0.5mL line and reassemble. This unique design allows you to quickly refill your Fantom and get back to vaping with absolutely no waste or mess to clean up after. Unlike most other similar devices, eDab's Fantom does not use any type of small magnetic adapter that is often easy to lose and expensive to replace.With this kit you will only enjoy the convenience and reliability of the traditional threaded connection system. Although eDab includes their premium oil attachment with every kit, the Fantom is designed to also be compatible with most 510 attachments on the market measuring up to 11.2mm in diameter, allowing for use with wider tanks. The eDab Fantom also sports notch-style air channels at the base to ensure sufficient airflow across all standard attachments. This pint size concentrate vaporizer is powered by an embedded lithium ion battery that features almost twice the capacity and output of most standard oil cartridge batteries. The 500mAh capacity will keep you pumping out fresh and tasty clouds at will, while the 15 watt output will keep you vaping efficiently and clog-free. When the time comes to recharge, simply connect the included USB charging cable. Use the innovative pass through charging function to continue vaping while you recharge if desired. Last but not least, the eDab Fantom is equipped with an innovative warm-up feature that heats your oils just enough to loosen them up and ensure every last drop makes it's way down into the heating element, leaving nothing to waste. Holy micro tiny smoking apparatus!!!!! This thing hits like a hurricane. Its my new fav. U can use any 510 thread cartridge pre-filled or the one included in the kit option. Best part is no magnetic adapter to keep up with. Can be broken down into three parts for stealth. Keep in mind its small enuf to lose but also small enuf to pocket anywhere. The clouds are pretty nice and the battery will last you thru and few days of heavy hitting.... Highly recommend. Shipping was hella quick... I will be buying again. Ordered on a Tuesday (on the west coast) received my item Thursday. Great Store, will definitely will order again. The eDab fantom works well with thick oils such as Truclear. The top filling cartridges makes it easy to transfer the concentrate into the cartridge. Unfortunately, the cartridge only holds .5ml Oil will leak out the top if you fill the cartridge exactly to the line or above. 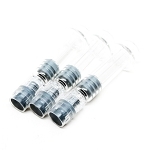 Larger 1ml eDab cartridges are available at additional cost but did not come with this eDab Fantom kit. The eDab is a powerful unit and produces a strong draw. A second or two is all you need to produce a good vape. If you do big draws then you will go through your oil super fast. There are air holes on the top of the cartridge to help regulate your draw. The unit has a 5 click on/off system which prevents accidental ignition. There is also a 3 click " pre heat " feature to loosen up thick oil which worked ok. I tried using 2 other vape catridges with the eDab Fantom and was not happy with the units performance. There were issues with clogging, oil not igniting properly and going in my mouth, and leaking at the connection point. These issues may be cartridge related or not. The prehear button did not solve problem. While I can recommend the eDab Fantom overall if you are using their cartridges, I do NOT recommend it for use with self fill cartridges such as Ccell. 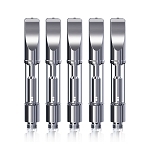 I would suggest that you use the .5ml eDab cartridge that comes with the kit and/or purchase the 1 ml eDab cartridge. This thing has been AMAZING. A great step up from the old e-cig type batteries I was using! Would recommend this to anyone looking to get one!